This is a collection of the best real estate WordPress themes to build a professional real estate website with WordPress. WordPress is a powerful content management system that works really well for running a real estate website. There are lots of high quality WordPress real estate plugins as well as professional looking real estate themes available. The real estate WordPress themes below will help you create a professional, highly functional and attractive real estate website with WordPress quickly, easily and most importantly cheaply. 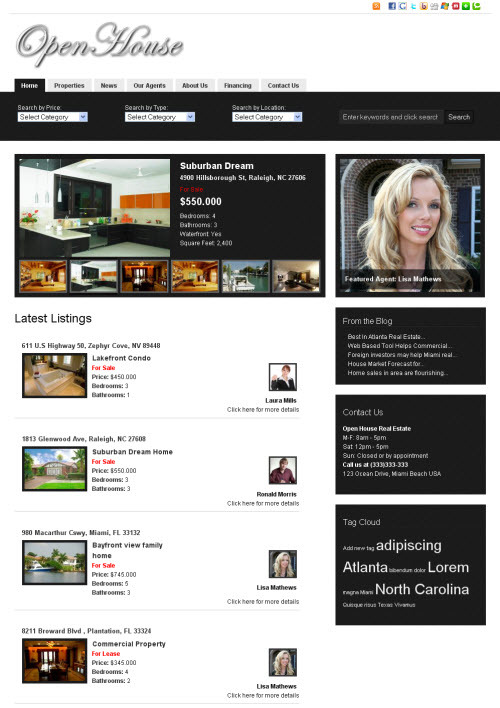 You no longer need to hire expensive web designers to build your real estate website. WordPress is free and open source, while a premium real estate WordPress theme will usually cost you less than $100. All the real estate WordPress themes below come with special features and functions required in a real estate websites such as advanced search functionality, custom property listing pages with property details and photo / video galleries, Google maps integration for property locations, featured listing sections, agent profile pages, integrated blog, inbuilt methods such as MLS/IDX to integrate your property listings into your website and more. Most of the real estate themes below also have a responsive design which means your website is mobile ready and optimized for viewing on mobile devices. It won’t matter if a visitor is viewing your site on a desktop computer, iPad, iPhone or other mobile device, your website will automatically adjust to deliver an optimized layout. So if you’re an individual real estate agent, a broker, real estate company or a property developer wanting to build a professional real estate website with WordPress these are the best real estate WordPress themes available. 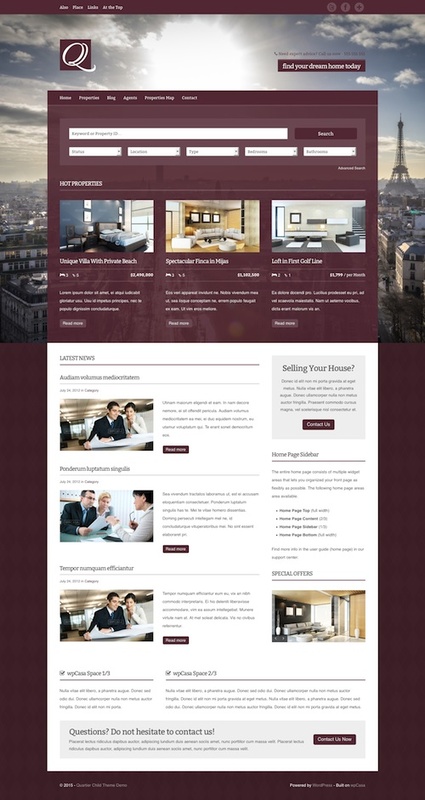 WPCasa London is an attractive and powerful Bootstrap based real estate WordPress theme from WPCasa. It has a stylish dark color scheme with a modern and flexible design to suit any real estate agency. WPCasa London is fully responsive and optimized for mobile devices. The theme uses the powerful WPCasa real estate plugin and associated add-ons for all the real estate management functionality. The theme itself also has heaps of great features including: a flexible homepage (with options to use ready-to-go homepage templates or build your own with custom widgets), header options for professional looking landing pages, theme customizer options (for easily managing your logo, color schemes with unlimited options, footer text etc), lots of widget areas (so you can drag and drop widgets to create your own complex content structures), widgetized listing pages, custom widgets (sliders, galleries, feature & newsletter boxes, call to actions and more), listings query template, impressive jQuery features and more. WP Pro Real Estate 7 is a professional, powerful and feature rich WordPress real estate theme from Contempo. 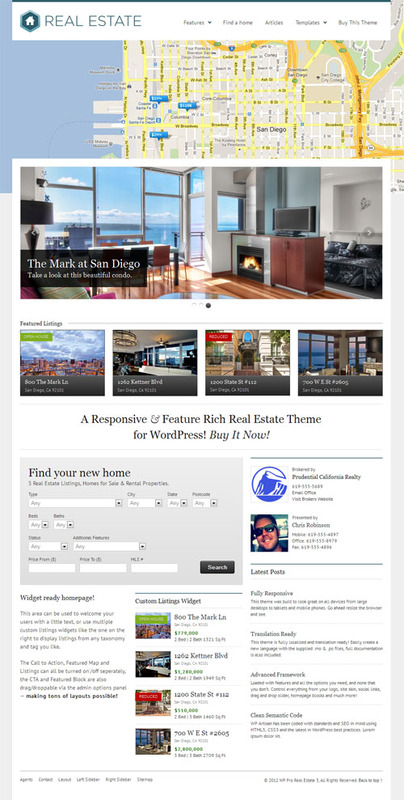 Marketed as “the end all be all of WordPress real estate themes” the premium theme could quite possibly be the last real estate theme you will ever need to purchase. It a great theme that comes with powerful options and tools, advanced search and mapping and extensive customization options. You can use the WP Pro Real Estate theme to build just about any type of real estate website – from a single real estate agency website, a paid real estate website portal, a vacations rental site like Airbnb, a site for apartment rentals to a single real estate listing landing page website. Some of the key features of the theme include: a mobile friendly responsive design, dslDXpress support, front end listing submission, powerful mapping, advanced search, extensive customization options, 5 pre-built demos, 3 header layouts, co-listing support, full booking system, file attachments support (for floor plans, contracts etc), sub listings and favourite listings, translation support, and much more. WPCasa Oslo is a real estate WordPress theme from WPCasa that’s powered by the excellent WPCasa real estate plugin. 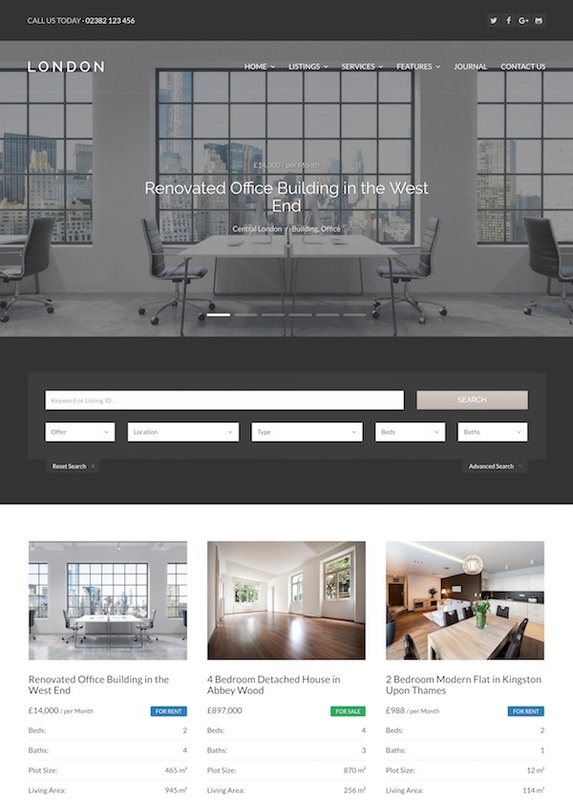 The premium theme has a light colored design and comes with lots of powerful widgets, widget areas, and useful options to help you easily built a professional and modern real estate website. Some of the key features of the WPCasa Oslo theme include: fully responsive and optimized for mobile devices, flexible homepage layout options, powerful header settings, intuitive customizer options (for logo, footer text, unlimited color options etc), lots of flexible widget areas (so you can create complex custom layouts with drag and drop widgets), widgetized property listing pages, one click demo importer, plus all the other great real estate functionality provided by the WPCasa plugin and associated add-ons. The WPCasa STAGE theme provides an ideal starting platform for building a custom real estate website with WordPress and the WPCasa real estate plugin. The premium theme from WPCasa is search engine optimized, fully mobile responsive and easy to customize. The source code and overall organization of the theme is clear and well thought out, based on a lightweight but very powerful framework that comes with HTML5, flexible CSS3 grid and a set of pre-styled elements. The theme features a flexible, widgetized homepage and single listing page templates so you can arrange the layout and content the way you want with drag and drop widgets. It also has a listing slider, listings carousel, unlimited color options, property image gallery, and all the other great features of the core WPCasa plugin. 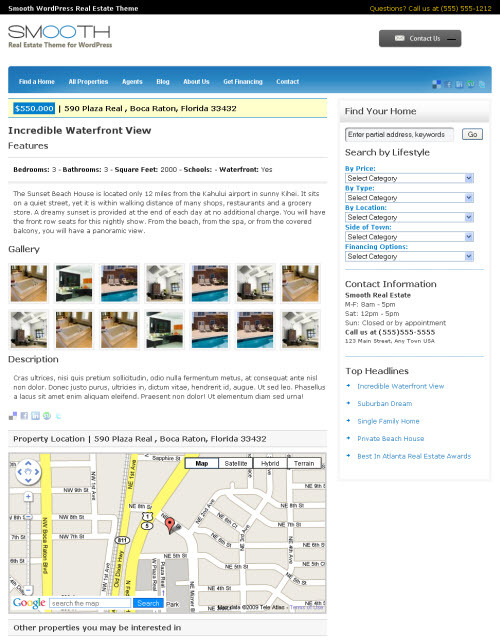 The WPCasa plugin that powers the theme features: an intuitive listing editor (add extensive property details, location information and image galleries), advanced property search (filter your listings by keyword, taxonomies and of course property details), admin property management (easily manage all your properties from the backend admin panel). WPCasa is flexible and extendable with lots of useful add-ons to further extend the functionality. Agent Focused Pro is a real estate WordPress theme designed with both real estate professionals and their clients in mind. The premium theme available from StudioPress has a unique and bold design that will allow you to showcase your properties, build an email list, blog and build your brand. Some of the key features and benefits include: customizable homepage (with property search, featured listings, featured communities, contact info and form and more), easy logo integration, striking full page backstretch image on the homepage, IDX integration support, color customization options, featured images of listings and pages, lots of widget areas, 3 layout options, mobile responsive, HTML5 markup, translation options plus all the great features and options of the Genesis Framework. WPCasa Elviria is a real estate WordPress theme that uses the WPCasa real estate WordPress plugin for a turn-key real estate website with lots of handy tools and features. 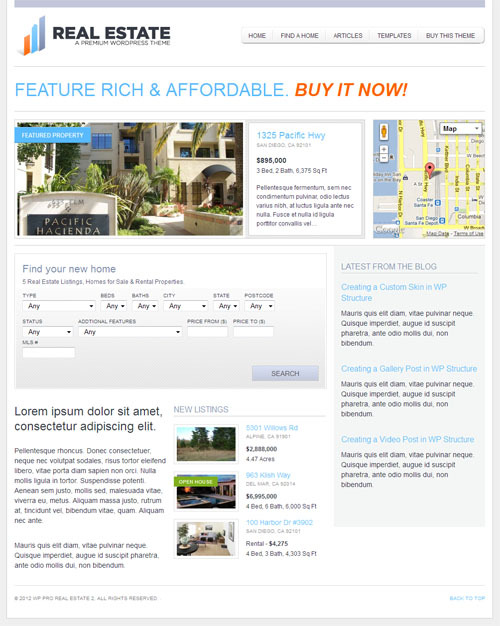 Some of the key features of the theme include: a full mobile responsive design, 2 different customizable homepage templates, widgetized property listing page, listing slider, listings carousel, unlimited color options, property image gallery, and all the other great features of the core WPCasa plugin. WPCasa is a professional real estate WordPress theme designed for both for WordPress newbies and experienced developers. It has a lot of inbuilt flexibility with custom property edit screens, comprehensive theme options, layout settings and drag-and-drop widgets so beginners can easily create fully featured real estate websites without coding skills. The framework also caters for experienced coders with extensive yet thoughtful use of WordPress action and filter hooks for advanced customisation. WPCasa includes a property editor to easily create and manage property listings. From a property edit screen you have fields and meta boxes to enter all the property features and details such as price, location, property type, property features, location map etc. The property management backend also includes filters to easily search and order your property listings. The wpCasa framework comes with an advanced search function so users can easily search for properties. It scans your objects by keyword or property ID, custom taxonomies, custom fields such as price or property status. You can easily change the form fields to your needs on the theme settings page. Comprehensive options let you individually set the layout of both single property, post and/or static pages as well as general property and post archives. wpCasa also has a set of extremely useful custom widgets. The entire front page and the single property page (as well as sidebar and the footer) are widget areas, so you can simply drag and drop your preferred widgets in the corresponding areas and your site is set with a few clicks. WPCasa has a backend options panel with a comprehensive range of theme settings and options to make it easy. You’ll find general options to upload your logo for example, property settings to set currency and features and search options to tailor the property search to your needs. wpCasa also comes with a list of handy shortcodes for buttons, alert boxes, sliders, galleries etc. It also natively supports WordPress standard features like custom menus, custom background image, custom headers, post formats and more. 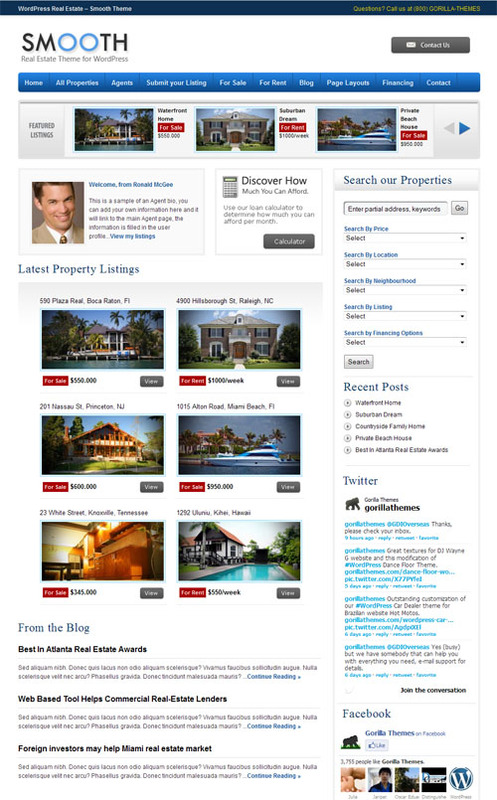 It’s important these days your real estate website is accessible to mobile visitors, so wpCasa has a responsive design. wpCasa and all the child themes are fully responsive so it will look great on all different devices from desktop computers to mobile phones. 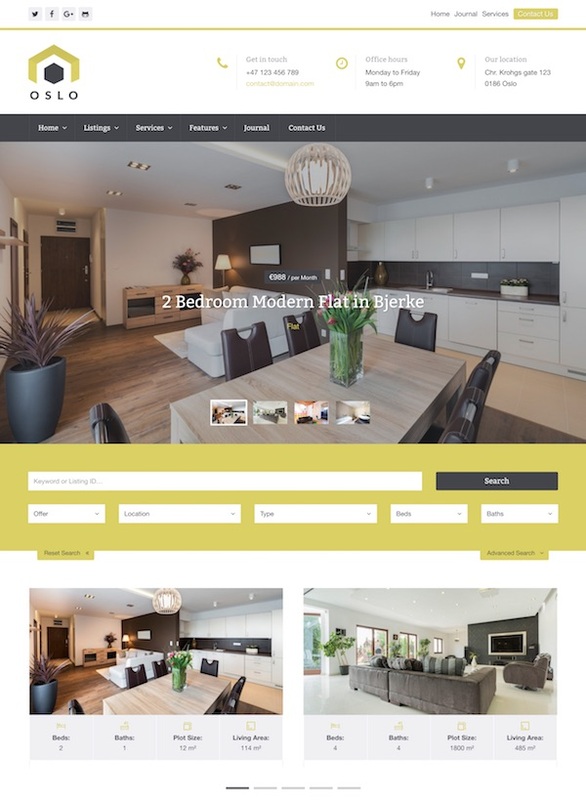 WPCasa Sylt is a real estate WordPress theme that’s powered by the powerful free WPCasa real estate WordPress plugin. The Sylt theme has an elegant and lightweight design that gives you lots of versatility to present your properties in a clear and stylish layout. Some of the key features and benefits of the Sylt theme include: a powerful homepage template, infinite color options, custom single listing page with multiple widget areas, mobile friendly responsive design, search engine optimized (with basic HTML structure and real estate microformat), eye catching listing sliders, listing carousels, beautiful image galleries with an elegant lightbox, theme customizer and more. Oikia is a premium real estate WordPress theme from cssigniter. It has a bold, modern and unique design that will ensure your real estate business has a professional online presence. Some of the key features of the theme include: a drag and drop homepage so you can create the layout you want, dynamic map and filtering system, property carousel, robust property management with a custom built properties display panel, multiple color schemes, custom widgets, SEO optimized, translation ready, mobile friendly and retina optimized, theme options and more. 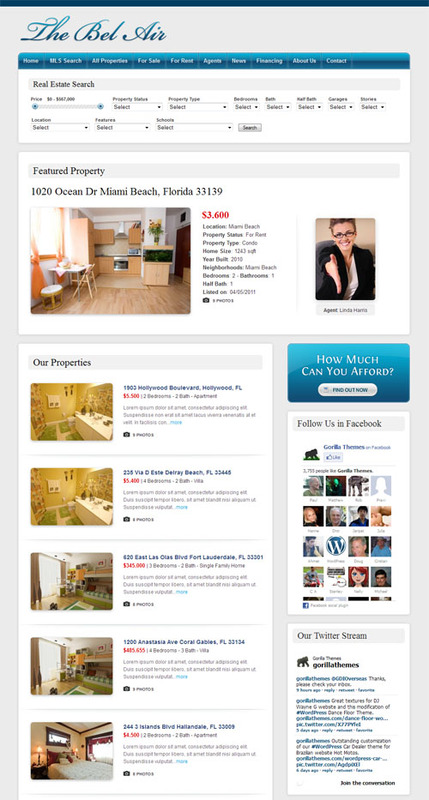 Realty is a real estate WordPress theme built for real estate agencies and independent agents. The premium theme from ThemeTrail has a modern and professional design and is fully responsive ensuring it looks beautiful on any device: desktop, smartphone and tablet. 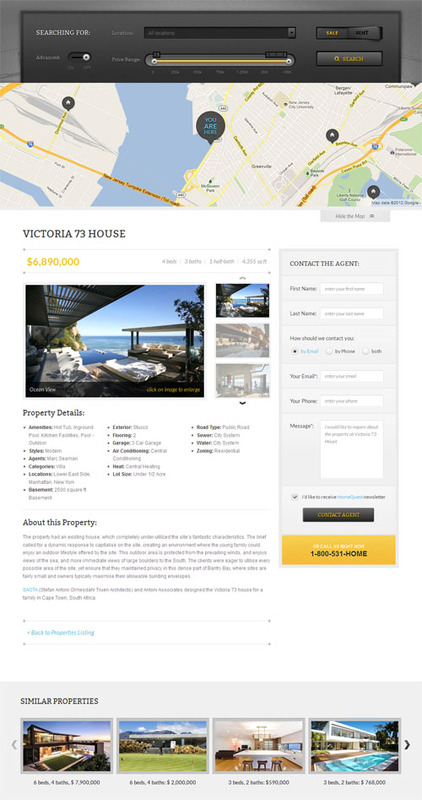 The theme has some great features including: an intro template (with fullscreen background slideshow and property search / maps toggle), powerful property management (easily create, customize and manage all your properties), customisable advanced property search, sortable property listings (grid or list views), Google maps integration (property map, custom map controls and map maker, geolocation etc), custom real estate widgets and shortcodes, beautiful property print, translation, ready, easy customisation options (layout settings, header & footer customization, home slideshow, property settings, typography, colours, contact page settings etc), and more. Bayfront is a flexible and elegant WordPress real estate theme from wpCasa. Bayfront is a child theme for the powerful wpCasa real estate framework so it inherits all the great features and functionality of that system. The Bayfront theme has a nice homepage design with a prominent property search box, custom background image and sections to display featured listings, newest properties, news and other information. You can easily change the logo, accent colors and background image to suit your brand. Some of the other key features of the wpCasa Framework itself include: advanced property management functionality, advanced search, custom widgets, various layout options, advanced options panel, fully localized (multiple language options), action and filter hooks for advanced customization, a mobile responsive design, and more. Luxor is a premium real estate WordPress theme for the wpCasa Real Estate Framework. The theme has a big header section with search – with options to easily change the colour or use a header background image to suit your brand and business. Being a child theme for the powerful and flexible wpCasa Real Estate Framework it inherits all of its great features and benefits. These include: advanced property management functionality, advanced search, custom widgets, various layout options, advanced options panel, fully localized (multiple language options), a mobile responsive design, and more. AgentPress is a premium WordPress real estate theme for the Genesis Framework from StudioPress. The theme is mobile ready with a fully responsive layout and has a modern and intuitive design with powerful functionality. It allows you to smartly and clearly display listings with all the relevant property details, a map and eye catching imagery. Some of the other key features of the theme include: 4 colour styles, 6 layout options, custom background and header, custom menus, HTML5 markup, landing page template, property listings template and all the other features and benefits of the solid Genesis Framework. Estate Engine is a powerful and feature rich real estate WordPress theme from EngineThemes that allows you to build your own site from different modules and features a dedicated mobile design. The theme is based on the Directory Engine theme and is built specifically for those who want to run a real estate site. It features: advanced search functionality, property management, options to submit properties, custom property details page templates and photo galleries, monetization options, page builder, Google maps, translation support, dedicated mobile version and more. 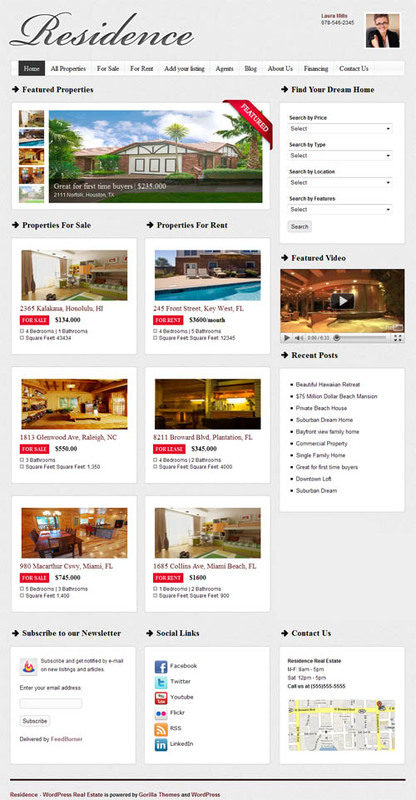 HomeQuest is a real estate WordPress child theme package that runs on the Directory theme platform from Templatic. The child theme and associated plugins transform the Directory platform into an advanced real estate directory portal. It gives you a unique custom homepage page, category pages and detailed property detail page templates. The homepage has a map with listings, property search box and sections to display recent and featured property and other information. Category and search result pages can display the list of properties in a list or grid (unfortunately a map view option is missing), while the property page displays large, full width images for the property and all the relevant property information, features, video etc can be presented. It also has submit property functionality so agents or other users can submit their property for listing from the front end. The theme also comes with support for the mobile view mode that provides a better experience on mobile devices that a regular responsive design by focusing on displaying the most important data. The HomeQuest Package includes: the Directory platform (three plugins and one theme), real estate add-on plugin, and the HomeQuest child theme. Winning Agent is a mobile responsive real estate theme for WordPress that runs on the Genesis Framework from StudioPress. It has a nice modern design and is a clean, light-weight real estate theme that will allow you to show off your listings in a professional looking website that will stand out from the competition. Some of the other key features of the theme include: a widgetzied homepage, four colour options, multiple layouts, listings with AgenetPress listings plugin or IDX feed of your choice, printer friendly styles, HTML5 markup, one-click upload backstretch background image, translation support and all the other great features and benefits of the Genesis Framework. WP Pro Real Estate 6 is a responsive WordPress real estate theme that is powerful and super flexible. The premium theme has lots of great features to showcase your real estate listings in a beautiful and professional website design. It has built in support for the popular dsIDXpress plugin, advanced custom built search functionality, powerful mapping utilizing Google maps, easy listing management, support for residential and commercial listings, custom agent lists, and support for multiple languages with WPMP compatibility. Design wise the theme is very flexible with a homepage builder for endless layout possibilities, full width or boxed layouts, grid or list layouts, custom Google fonts, various background patterns and more. Re:house is a neat and clear real estate WordPress theme that runs the solid wpCasa Real Estate theme framework. The Re:house child theme is from WPCasa and has a neat and professional layout with a high contrasting colour scheme as a result of its dark header and light content areas. Through the WordPress customizer you have unlimited options to set the accent colour to your liking. The Re:house child theme is mobile friendly with a responsive layout and inherits all the great real estate features / functionality and customisation options of the powerful wpCasa Framework. WP Pro Real Estate 4 is a powerful, purpose built real estate theme built to showcase your real estate, vacation rentals or other listings. The premium theme has a beautiful design, is loaded with features and has a mobile responsive layout is it will work on all devices and screen sizes from desktops to mobiles. Some of the features include: built in dsIDXpress plugin support, boxed or full width layout, easy listing management, drag and drop homepage manager, a powerful page builder, advanced options panel, 14 custom widgets, powerful custom built listing mapping, advanced search and more. Paraíba is a real estate WordPress theme for the excellent wpCasa Real Estate WordPress Theme Framework from wpCasa. The Paraiba theme is mobile friendly with a responsive layout and has an elegant and professional design with unlimited accent colour options and a customisable header image. Being a child theme it also inherits all the other great real estate features / functionality and customisation options of the powerful wpCasa Framework. Some of the other key features include: a custom property editor, comprehensive theme options, layout settings, drag-and-drop custom widgets, advanced search functionality, shortcodes, as well as thoughtful use of WordPress action and filter hooks for advanced customisation. Quartier is a stylish real estate WordPress theme from wpCasa. The premium child theme inherits all the functionality of the powerful wpCasa Framework theme. It uses the WordPress customizer so you can easily change the look and feel of the site. You can easily change the accent colours, upload your own header image that covers the header background area and upload your logo. Being a child theme for the powerful and flexible wpCasa Real Estate Framework it inherits all of its great features and benefits. These include: advanced property management functionality, advanced search, custom widgets, various layout options, advanced options panel, fully localized (multiple language options), a mobile responsive design, and more. Marbella is a WordPress real estate child theme for the wpCasa real estate framework. The premium theme from wpCasa has “a clean and extravagant design with a touch of elegant summer feeling”. The Marbella child theme is customizable through the WordPress customizer so you can easily change the header image, accents colours etc. It also inherits all of the great features and benefits of the powerful and flexible wpCasa Framework. It’s extremely flexible and comes packed with lots of great features such as a custom property editor, comprehensive theme options, layout settings, drag-and-drop custom widgets, advanced search functionality, shortcodes, as well as thoughtful use of WordPress action and filter hooks for advanced customisation. 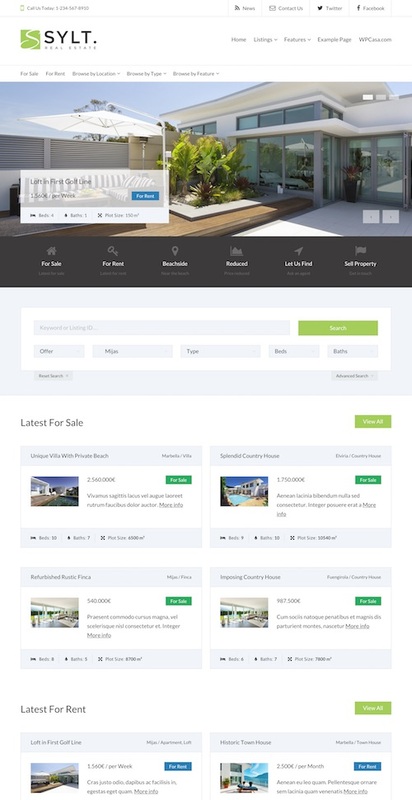 Realtor is a premium real estate WordPress theme designed for real estate agencies, real estate agents, real estate portals, and real estate listing sites. The commercial theme from Tesla Themes has a clean and professional design with a range of great features so you can easily list and sell your properties. Some of the key features include: a mobile responsive design, grid or list properties view, properties map (built using Google Maps API), two different single property layouts, agents listing and single agent view, submit a property functionality, advanced property filter and search, color customization options, Font Awesome icons, translation support, HTML5, CSS3 and W3C valid source code, and more. 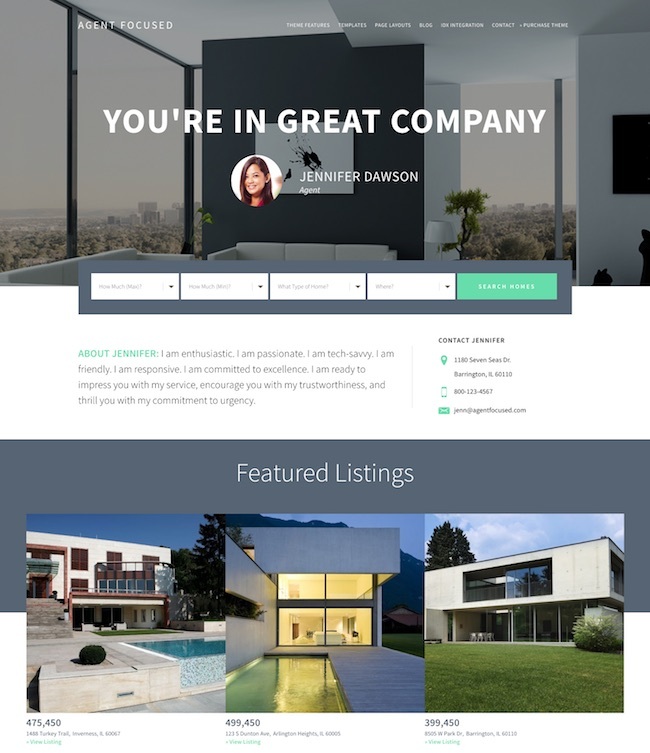 Unreal Estate is a mobile friendly responsive real estate WordPress theme. It allows you to display lots of properties, search for properties with various criteria, and provides 3 different layouts to display properties. The premium theme is built in Bootstrap. Some of the other features include front end submission, advanced property search, contact form, Google maps integration, Agents integration, theme options panel, translation ready and more. The Shandora Real Estate WordPress theme has a bold, modern and flexible designed suitable for complex and simple real estate property listings. The premium theme has a retina and mobile responsive design and is built using the Foundation 4 framework. It comes with a built in page builder so you can create your own page layouts, a powerful and customisable search form, property listing page, compare property function, Google maps, IDX Integration using dxIDXpress Plugin, HTML5 and CSS3 code, live chat plugin, theme options panel, custom fonts / background / colours and more. 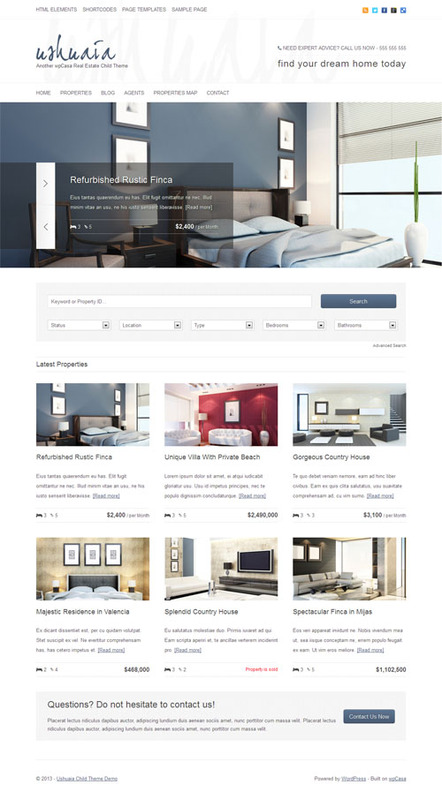 The Properta real estate theme has a professional modern and flat design with lots of great features. The homepage has a Google map showing listed properties, search box, features properties, recent properties and sections for other information. Some of the features of the theme include: front end submission so users can post their own properties, PayPal integration so you can charge for listings, advanced Google maps with clustering and live map filtering, 15 custom real estate widgets, property management, dsIDXpress plugin support, translation ready and support for WPML and more. Design wise the theme has developer friendly code based on Bootstrap and SASS and is mobile ready with a responsive layout. Penthouse is a child theme for the WPCasa real estate WordPress theme framework. The theme has a mobile responsive design. It has a lot of inbuilt flexibility with custom property edit screens, comprehensive theme options, layout settings and drag-and-drop widgets so beginners can easily create fully featured real estate websites without coding skills. The inbuilt property editor lets you easily create and manage property listings – easily enter and manage all the property features and details such as price, location, property type, property features, location map etc. The framework also caters for experienced coders with extensive yet thoughtful use of WordPress action and filter hooks for advanced customisation. Locate is a responsive real estate WordPress theme from 7Theme for real estate agents. The theme provides a flexible solution for managing real estate properties with powerful options to display properties and communicate with potential buyers. It comes with a lot of useful real estate features including: advanced property search, property management, customizable taxonomy template, grid or list layouts for real estate, maps, multiple agents, property slider, shortcodes for property features details etc, and more. Some of the other design aspects of the theme include: 9 different slideshows / headers, unlimited colour schemes and sidebars, options panel for customization (change all colors, backgrounds, fonts and font sizes etc), 600+ fonts, custom widgets, 380+ retina ready icons, translation options, HTML5 and CSS3 code, responsiveness (on / off) and much more. WP Pro Real Estate 4 is a powerful, super flexible and responsive real estate WordPress theme. The premium theme is feature packed and purpose built to showcase your listings in a clean, professional and functional way. It has a drag and drop homepage builder so you can create the homepage layout you want, and you can also choose from 3 column, left column or right column layouts individually for single listings, search listings, pages and posts. It is built on an advanced framework and has a fully responsive design so will work on all mobile devices. Some of the other features include: powerful advanced search, custom widgets and shortcodes, leading edge property mapping, custom post types, taxonomies and fields, an extensive options panel, unlimited skins, custom backgrounds and more. WP Pro Real Estate 4 can be used for real estate, vacation rental, car sales websites and more. A professional real estate WordPress theme from Gorilla Themes. The theme has a custom property management module that allows you to add all your property information in one place, from property price to full details, features, video, location and Google Maps integration with Street View. It is compatible with all markets with currency and metrics selectors and a dynamic search custom setup will give you the option to build your own search module. Other features include optional IDX & MLS integration (dsIDXPress), featured property carousel, custom real estate widgets, 5 colour styles and more. 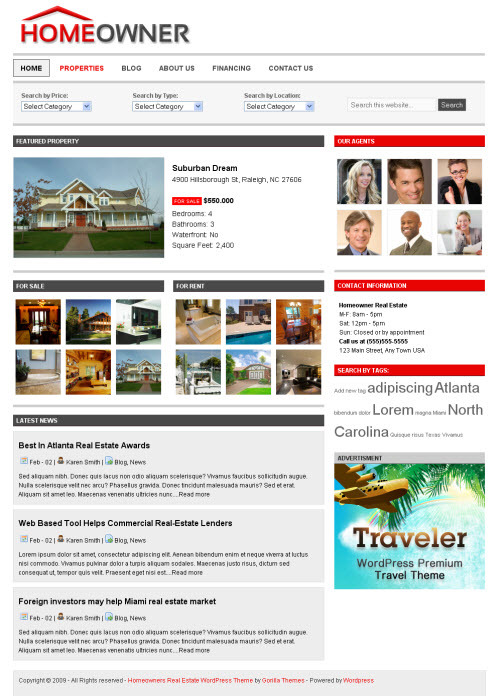 Real Homes is a nice and clean premium WordPress theme from real estate related websites. The theme has a modern and flat design that is responsive (mobile ready) and is loaded with great real estate features. Features include: advanced property search, list & grid property listing, dsIDXpress IDX Plugin support, image gallery and video support, custom widgets, various templates (properties, gallery, agent details, contact etc), easy and extensive theme options, easy to use metaboxes and more. The Bel Air WordPress Real Estate theme from Gorilla Themes has MLS-IDX search integration and is a fantastic theme for displaying your real estate listings. Built from the ground up on top of the Gorilla Themes framework, agents can login, modify and delete their own listings with a clutter free easy to understand administration. The theme can be used for a single or multiple agents platform. The Bel Air feature dynamic menus and multiple sidebars customizable within the admin, 6 colour styles and a layout selector to use the theme with left or right sidebar. 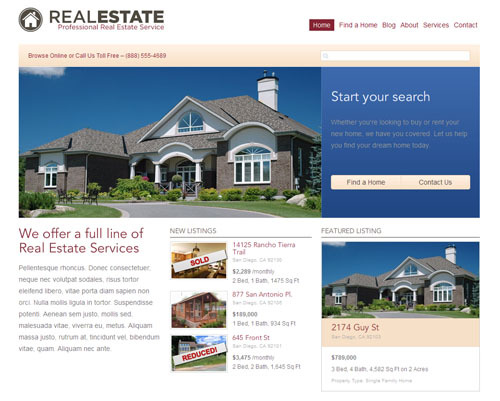 The WP Estate theme is a professional looking mobile ready WordPress template for real estate websites. The theme could be used by real estate companies and independent agents. It can be used out of the box or customised up to smallest elements to suit your requirements or brand. WP Estate has a long list of features, and just briefly some of them are: advanced property search, Google maps and geolocation, pin and icon management, easy property management and powerful admin panel, front end submission, dlsIDXPress ready, custom page templates, shortcodes and much more. A real estate WordPress theme from Elegant Themes that turns your WordPress site into a fully functional professional real estate website. The theme includes custom property listing layouts and theme options for property info, photo galleries, Google Maps and more. The theme also includes 5 colour scheme options and an optional blog style structure if desired. Casanova is a child theme for the WPCasa real estate WordPress theme framework. The theme has a mobile responsive design. It has a lot of inbuilt flexibility with custom property edit screens, comprehensive theme options, layout settings and drag-and-drop widgets so beginners can easily create fully featured real estate websites without coding skills. The inbuilt property editor lets you easily create and manage property listings – easily enter and manage all the property features and details such as price, location, property type, property features, location map etc. The framework also caters for experienced coders with extensive yet thoughtful use of WordPress action and filter hooks for advanced customisation. 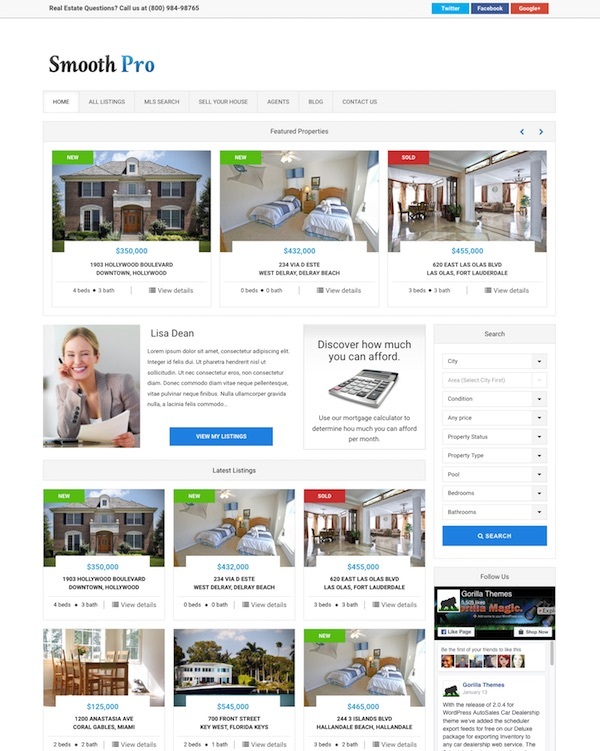 A premium WordPress real estate theme from Gorilla Themes. The theme has a dynamic real estate framework management module to easily add, edit and delete features and customise to your requirements. Features include 5 colour styles, multi category search, Google maps integration, easy photo gallery management and property slideshows, theme localisation for different languages and more. Realia is a robust premium real estate and rental portal WordPress theme with a flat modern design. It’s based on Bootstrap and SASS and built with HTML5 and CSS3 valid code. The theme is fully responsive to work on small smartphone screen up to large monitors. You can choose from 20 colours variations, 10 background patterns, 3 header setups and boxed or full width versions. Some of the real estate features include: dsIXDPress plugin support – the leading IDX / MLS real estate search plugin, easy property management, front end submission system for users to submit properties, PayPal integration to accept payments, Google maps integration, and more. Real Estate 2 is a professional looking theme from Templatic designed to turn your WordPress site in a real estate portal. 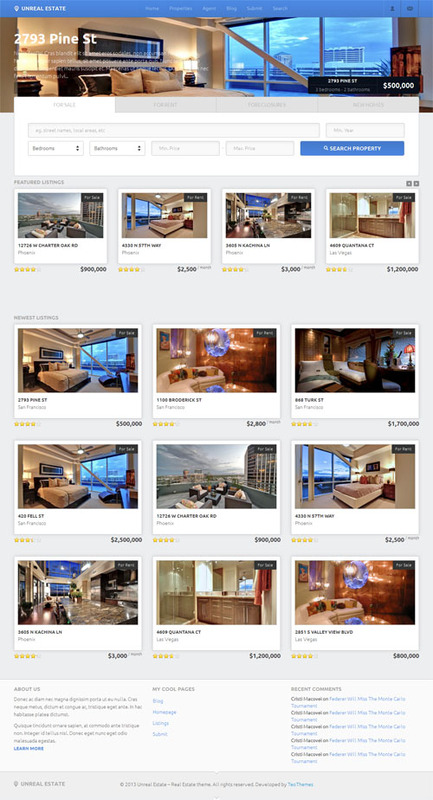 Features include a dynamically generated gallery of featured properties on the homepage, multi category search, custom property listing and details page, photo galleries, similar properties section, Google maps and more. 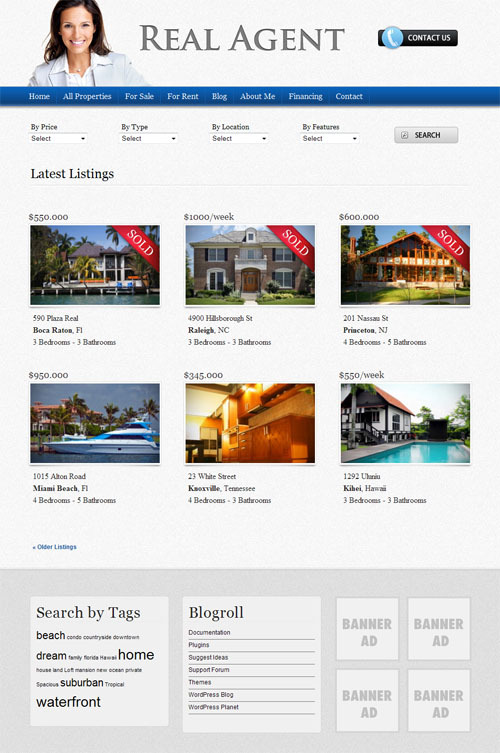 Realtr is a real estate WordPress theme from Templatic. The theme has a completely widgetized homepage offers great flexibility while built-in SEO options provide a head start on the competition. Other features include list, grid and map views, custom fields for property details, news blog section, bulk upload and export, MLS/IDX support and more. A real estate WordPress premium theme from Gorilla Themes. The theme features a dynamic real estate framework management module to easily edit-add-delete property fields and customise to your needs. The theme also includes multi-category search, easy photo gallery management with drag and drop sorting, featured property slideshow, 7 colour scheme options and more. A real estate premium WordPress theme from PremiumPress that will transform WordPress into a fully functional, easy to manage, easy to customize, feature packed Real Estate website in minutes. This professional theme is a turn-key ready “out of the box” real estate website solution for WordPress which could be used by individual agents, real estate companies, brokers and property developers. The theme allows you to easily add property listings via the custom backend admin area or import CSV spreadsheets. It features customisable search options, Google maps integration, real estate data custom field creator, image management tools, agent profiles and more. Estatement is a flexible and mobile responsive WordPress theme for managing real estate properties. 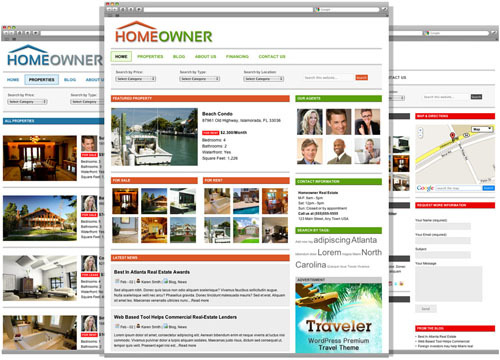 The theme gives you powerful options for displaying your properties and communicating with potential buyers. Estatement property listings allow you to build specific property lists, including only houses, semi-detached houses, apartments, and so on. Some of the other features include: advanced property management functions, live filter search, powerful booking management and payment options, dsIDXPress support (for MLS/IDX data), agent list template, fully customisable page search and map based search, contact options include customizable auto-responders, and more. A professional real estate WordPress theme from Gorilla Themes. The theme has a dynamic real estate framework management module making it easy to manage listings and customize to meet your requirements. The theme includes a multi category search builder, Google maps integration, easy photo gallery management with drag-and-drop sorting, 8 different colour styles and more. A professional real estate WordPress theme packed full of features from Gorilla Themes designed especially for Realtors and Real Estate agencies. The fast loading theme is compatible with all markets as you can add your own currency, and features Google maps integration, a custom backend to manage / update real estate listings, 6 provided colour styles and more. WP Pro Real Estate is a clean and simple theme for WordPress that allows you to create a dynamic content managed site for use in the real estate business. It’s simple to get up and running, and includes many features allowing for complete customization. Features include a custom write panel for price, location, sq ft, etc…, built in Google maps, dynamic image resizing, searchable listings, multiple images per listing, custom theme admin panel and more. WP Pro Real Estate 2 is an advanced and easy to use real estate theme for WordPress. The premium theme makes use of WordPress 3.0’s Custom Post Types and Taxonomies offering unparalleled property listing management and search capabilities. It has Google Maps integration, Advanced Search, Custom User/Agent Profiles, Easy Image Management and more. The theme can be used for more than real estate listings too, like a auto dealership, boat dealership, vacation rentals, review site and much more by easily customizing the taxonomies! Locality is an attractive and purpose real estate WordPress theme. Features include a featured properties slider on the homepage, properties search functionality, custom widgets, shortcodes, easy theme options and more. A responsive real estate WordPress theme. 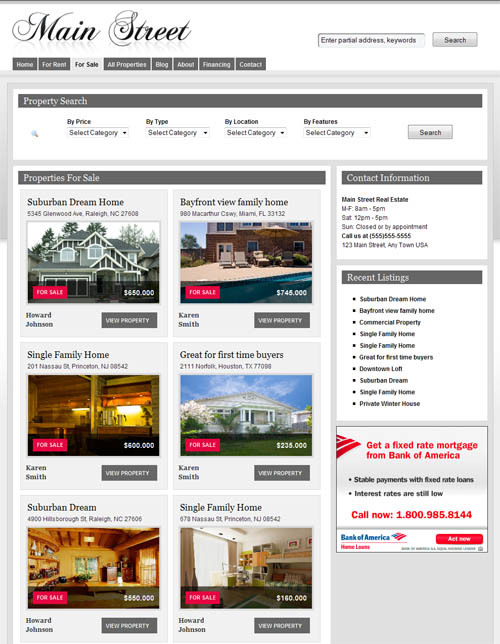 The powerful theme is purpose built to showcase your listings, loaded with more features. Features include a drag and drop homepage builder, unlimited skins and backgrounds, custom widgets, slider with touch support, as well as a bunch of real estate specific features. 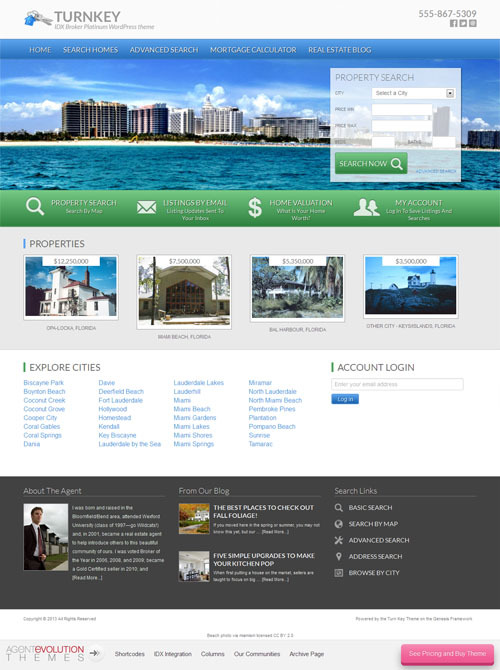 The theme can be used for anything from real estate to vacation rentals to automotive sales. A highly customisable Real Estate WordPress theme from Gorilla Themes. The theme features 5 different colour scheme options, Google maps integration, custom plugins and scripts to easily add and manage property listings, a financing calculator and more. A professional real estate theme for WordPress from Gorilla Themes which provides an ideal solution for Realtors and Agents to showcase their properties with ease. 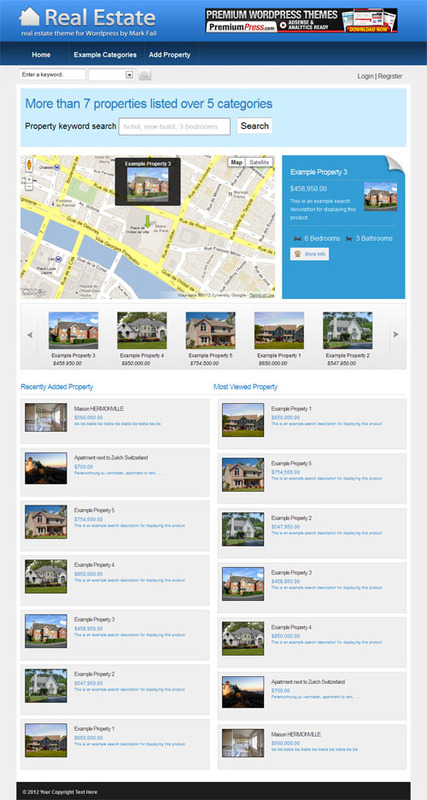 This professional theme comes complete with Google Maps integration and features a custom backend to easily insert and manage property listings. 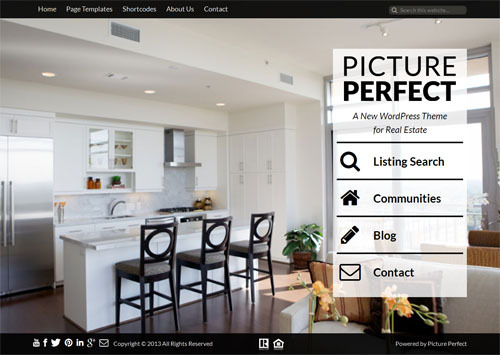 Picture Perfect is a responsive real estate WordPress theme from Agent Evolution. The theme runs on the Genesis Framework. The Picture Perfect theme is designed for maximum visual impact with full screen background images and options to really show off your professional real estate images. Other features include customisation options to change the design elements and colours to match your brand, various shortcodes and widget styles, and a mobile responsive design. A responsive real estate child theme designed for the Genesis Framework ideal for a professional real estate business website. Features include a mobile responsive design, options panel and customisation options, shortcodes and widget styling, IDX broker integration and all the features of the Genesis theme framework. 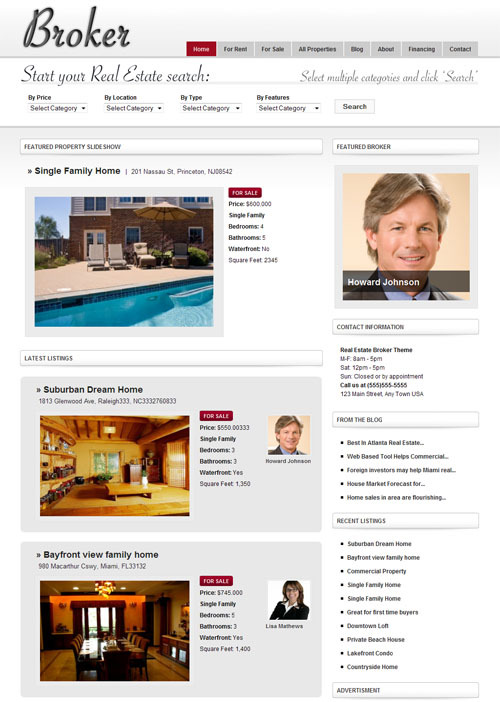 A responsive Genesis real estate child theme for IDX Broker Platinum with full MLS search capabilities. Features include a mobile responsive design, options panel and customisation options, shortcodes and widget styling, IDX broker integration and all the features of the Genesis theme framework. A WordPress real estate theme from Gorilla Themes suited for individual or multiple agents with easy listing management administration. The theme includes 2 colour styles, multi-category search with breadcrumb filtered results, easy photo gallery management with drag-drop sorting of images, automatic Google Maps integration and more. Home Quest is a quality real estate WordPress theme ideal for real estate agencies and brokers needing a modern and unique website to showcase their properties. 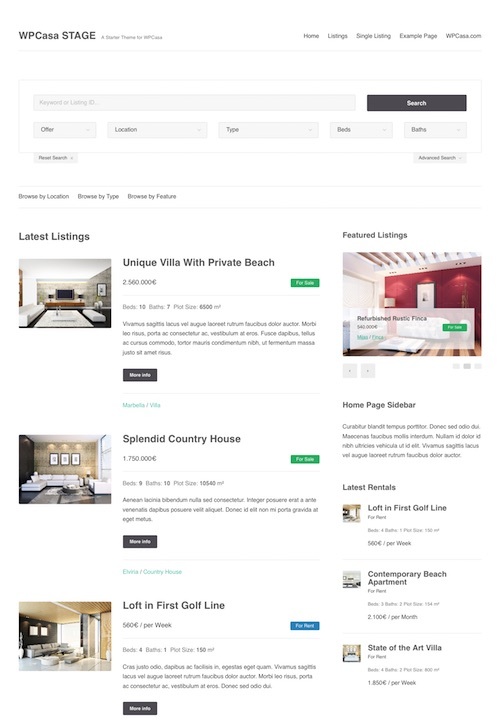 The premium theme from Theme Fuse has all the features you need to attractively display real estate properties with a custom homepage and featured properties slider, custom properties page template, powerful search and filtering options, and Google maps with nearby properties. The premium theme also has multiple colour options and background styles, detailed contact form, integrated blog, powerful admin options panel and more. Freehold is a fully featured real estate WordPress theme with a responsive design and optimized for retina displays. 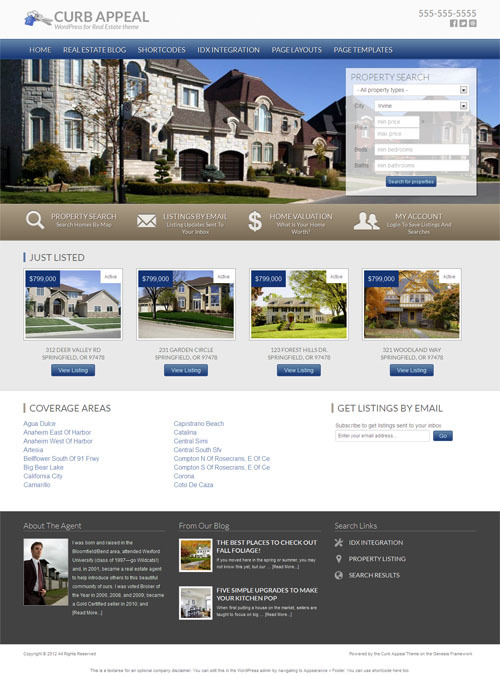 The premium theme is easy to customize and has some great real estate specific features. It has advanced real estate search and sorting, custom Google Maps integration, real estate agent support, unlimited property images, print styles for property listings, and multiple real estate custom widgets including featured listings and open houses. The retina display support and responsive design means it will work properly and look great on all mobile devices. Open Door is a feature packed, responsive real estate WordPress theme which combines both real estate and car sales into the one theme. So you can use this theme to either sell real estate or sell cars. Some of the notable features for the real estate mode include: customisable advanced search with various search parameters, Google Maps search results, dual agent support, Google Map and Street View on listing details page, optional MLS listings support with dsIDXpress, open house date and time listing, contact forms and more. The theme has an extensive options panel, unlimited colour schemes, video support, a loan calculator, compare listings options, a mobile responsive design and lots more features. Ushuaia is a premium real estate WordPress theme with a responsive layout that runs on the professional WPCasa Real Estate Framework. It has an elegant, modern and minimalist design ideal for professional real estate websites. Ushuaia has a full width slider on the homepage and all the other great functionality of the of the wpCasa real estate framework. The Framework is designed for both for WordPress beginners as well as experienced developers. It’s extremely flexible and comes packed with lots of great features such as a custom property editor, comprehensive theme options, layout settings, drag-and-drop custom widgets, advanced search functionality, shorcodes, as well as thoughtful use of WordPress action and filter hooks for advanced customisation. 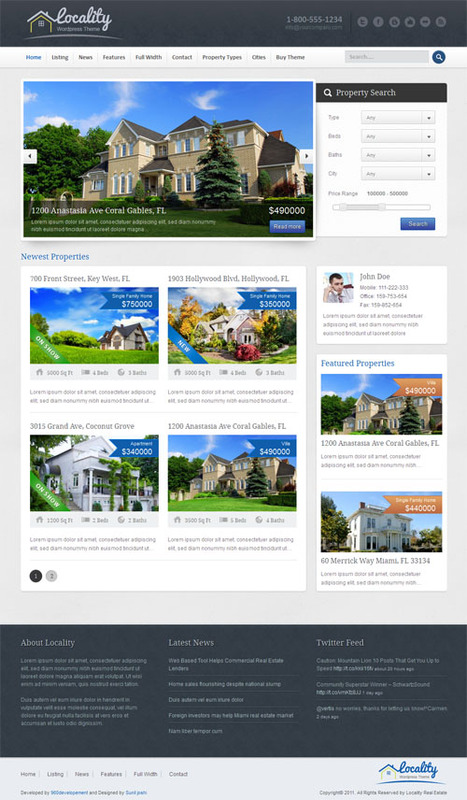 Real Expert is a mobile responsive real estate WordPress theme with a clean and modern design. The theme is mobile friendly and built on Twitter Bootstrap framework. Some of the key features of the theme include: a USA map search map (plus other countries), 3 homepage template options, advanced property search, real estate page templates, Google fonts, unlimited colour options, custom widgets, Google maps integration, multi-language translation ready, HTML5 and CSS3 code, theme options panel and more. The Real Estate Directory WordPress theme from Templatic allows you to build and manage a mobile friendly real estate portal website with WordPress. 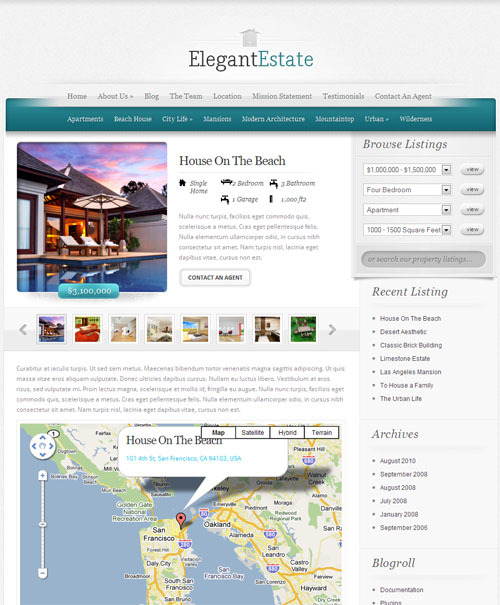 The real estate theme is based on the Directory Theme and shares most of it features and functionality. Some of the key features of the Real Estate Directory theme include: extensive property management options, property details page (property information, map, images, videos, contact & share buttons etc), customisable widgetzied homepage, category page layout options (grid, list and map views), front end property submission, options for creating payment options for submissions, extensive search functionality and filters, property price sorting, multi-city and maps functionality, dslIDXpress capability, agent details widgets, financing calculator, integration with popular WordPress plugins such as Gravity Forms, WPML for multiple languages and much more.